A happy top bar hive. The comb is upside down and covered with bees. 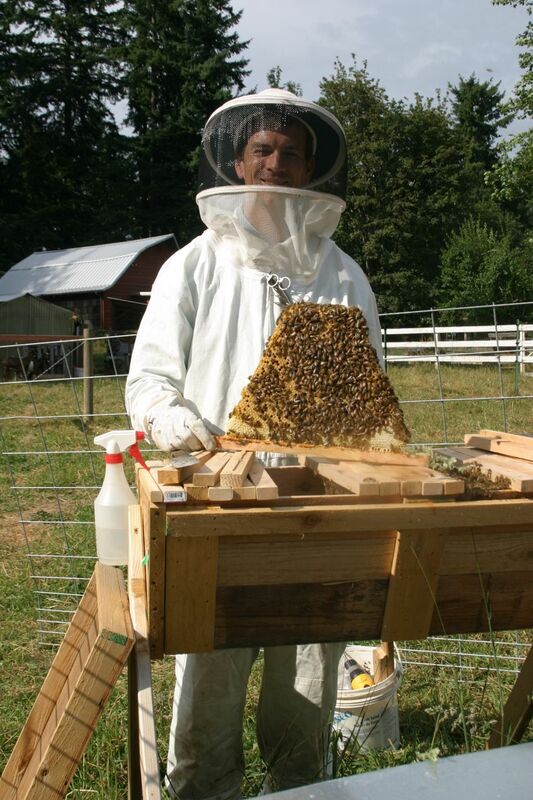 I’m glad to hear you are looking at beekeeping-the more of us there are, the better! I chose this route because I believe it is the best way to manage hives without treatments (medications, essential oils, etc…). As with the other animals that we raise on our place, the organic approach works, but requires more labor and attention. My main concern is two-fold. 1. I didn’t want to place doped-up wax foundation into my hives, and letting the bees create their own wax is the easiest way to avoid that. The medications that conventional beekeepers apply at least twice/year are all wax-soluable, so they all accumulate year after year until they are discarded as unusable by the beekeeper. The wax is quite valuable, so the beekeepers sell it to the companies that mill the foundations that go back into the hive. 2. I want small cell bees. Standard foundation already has the comb size embossed into it, and it is artificially large. This means that the workers are a little larger than “natural” bees, and because they are larger it takes a day longer for them to emerge from the cell. This extra day allows the varroa mites to complete a 2nd generation inside the cell with the bee larva. So by helping shorten the time it takes for a baby bee to hatch, I can minimize the number of mites in the hive. A challenge with regressing to naturally sized bees is that it takes several generations of workers to get there. A 5.3 mm worker will naturally draw a 5.1 mm wax comb. The worker that emerges from a 5.1 mm comb, will draw 4.9 mm comb. Gradually this process will converge to a stable point. Because the wax in a top bar hive is harvested with the honey, it naturally removes the comb. In foundationless, I’ve got to cull frames based on size. It still works, but is an extra step. Making the bees draw their own wax does slow them down considerably. I captured several swarms last summer, and all but the last one went into top bar hives. Although they are still alive, most of them are quite small still. The last one I brought home came in early August, and the only equipment I had was 2 boxes with empty drawn comb of conventional langstroth boxes. The queen immediately filled all the available comb with eggs and in 3 weeks the population boomed and the hive was able to bring in enough stores for winter because it had enough bees to do the work. I doubt it would have survived if it had to draw it’s own comb first. Last year I also realized that I don’t have the time available to properly manage top bar hives. A couple of them started to go cross-combed on me and I didn’t catch it in time to correct. This means that I’ve got to cut off and adjust the last few bars when the weather warms up enough. It’s not a big deal, but it’s time I’d rather use on other projects. Combining that with my decision to increase my hive count this year, I’m shifting my approach once again to Langstroth hives, but with all deep boxes (9-1/2″), with foundationless frames. 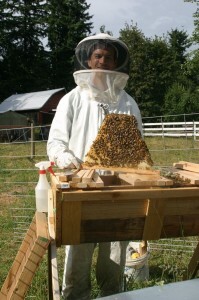 This entry was posted in Top Bar Hives and tagged Foundationless, Top Bar Hive. Bookmark the permalink.